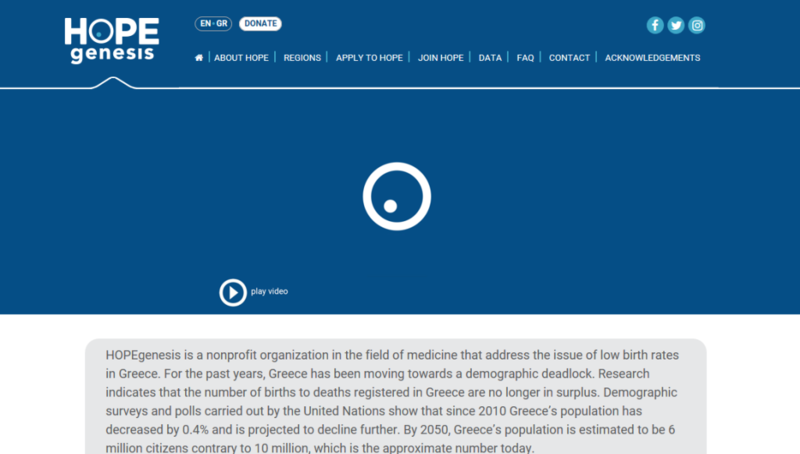 HOPEgenesis is a nonprofit organization in the field of medicine that address the issue of low birth rates in Greece. For the past years, Greece has been moving towards a demographic deadlock. HOPEgenesis’ mission is to provide comprehensive medical care and treatment for women who become pregnant until the day they give birth. The organization focuses on women living in isolated islands and remote areas in Greece, and aims to establish close collaboration with local communities in order to provide the necessary assurance to women who are already pregnant as well as the motivation to those contemplating on becoming pregnant and having children. HOPEgenesis’ overall mission is to contribute to the revival, development and the gradual increase of Greece’s population. HOPEgenesis was founded in 2015 by Dr. Stefanos Chandakas MD MBA PhD,Obstetrician-Gynecologist and Minimal Access Surgeon. The founding members are a group of experienced professionals with backgrounds from fields such as health care, media-communication, business development and culture. The team is supported by gynecologists, nurses, midwives, administrative staff and volunteers who share tha same goals and vision with HOPEgenesis. Finally, HOPEgenesis enables women living in remote areas of Greece, regardless of the financial situation, to travel to Athens and be properly monitored on their pregnancies by a team of obstetricians-gynecologists. Most importantly, HOPEgenesis enables pregnant women to give birth in a reliable maternity hospital, absolutely free, with no economic obligation and regardless of their financial background.